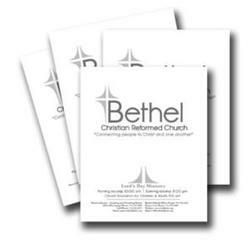 The bulletin is distributed weekly during Bethel CRC's worship services. It provides information regarding the morning and evening worship services, upcoming events, thank you notes and other pieces of information. As a general rule, each Sunday's bulletin is available here online the Thursday prior to the upcoming Sunday. Click on the links below to open the bulletin for the Sunday you wish to view. 1) The bulletins are in Word Document format. 2) Bulletin announcements are due by 12 p.m. (noon) each Thursday. We're excited to announce a NEW feature of Children's Worship Bulletins. Children can search the front cover of their bulletin for a secret code that unlocks hours of fun learning at home! hazards of general Internet game sites. Several games are rotated —Memory Match, Word Search, Gems of the Bible and Coloring Book — so each week kids will have something new to play. The games are geared toward all age levels so everyone can join in the fun! Step 3: Pick a game and play!